This research focuses on the Pantawid Pamilyang Pilipino Program (4Ps), a poverty alleviation measure that was implemented in the Province of Apayao, Philippines. A social policy aimed at conveying the poorest households from the intergenerational cycle of poverty by investing in human capital development. The program had the purpose of providing cash assistance on the condition and expectation that it would be spent for education and health needs of the households. However, one of the characteristic of cash transfers is that decisions of spending lies heavily on the decisions of the households as determined by current needs and priorities. Hence, the deviation from the program’s noble intention. 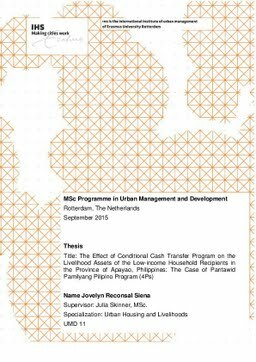 This study pursues in adding to the general knowledge on the impacts of conditional cash transfers to the livelihoods of recipients. In this regard, it seeks to find out the effects of the 4Ps program to the assets of the low-income household recipients in Apayao by looking into first, how the program was implemented, second, how risks influence household CCT utilization, third, why they used the CCT outside the conditions, fourth, how the CCT affect the changes of livelihood assets, and lastly, the perception of the recipients about the program. A quasi-experiment design was employed where two independent comparison groups were established in order to capture the impact of the 4Ps program. The treatment group consisted of the program recipients while the control group was composed of non-recipients. The groups were compared in two periods, before the program was implemented in 2007 and after the intervention in 2013. The information gathered before and after were dependent on the recall data provided by the respondents which were collected using both qualitative, with the aid of interview questions administered to recipients and implementers, and quantitative, via structured questionnaires handed-out to recipients. The results were then processed and analyzed to establish the impact of the program by comparing the recipients with the non-recipients. The control group was important as it provided the picture of what it should have been without the 4Ps program and afforded a very good point of comparison. Relevant literature suggests that the utilization of resources by the households are dependent on their current needs and priorities which are also influenced by the level of concern on threats and level of worry on external shocks. Households then tend to invest in different strategies for the purpose of spreading risk at the same time attaining household security. As a result, the strategies they choose largely determine their livelihood outcomes. Research findings revealed that the program had a positive impact on the livelihoods of the program recipients primarily on the improvement in the level of household income. As a result, though the level of concern on risk was still there, a decrease was significant. Further, with the cash assistance provided, the recipients were able to sustain their needs for survival and became more capable in coping with the occurrence of risks. More importantly, significant improvements in the recipients’ human, physical, social and financial assets were evident. Summing it up, the 4Ps program had a positive impact on the livelihood outcomes of the recipients. But despite these findings, some recipients were still not satisfied and claimed that the program was not effective. Recommendations for the improvement of the program was then included in this paper.